Spread out and relax on this power reclining sectional. The sectional features extra wide seats for a spacious design. Nailhead trim detail on the rolled arms and back give the plush sectional a touch of class, while pad-over-chaise bucket seats deliver comfort from head to toe. Three power reclining seats let you recline at the touch of a button, while an included console with cup holders, a storage compartment, and USB ports ensure you have all of your essentials close at hand while you watch a movie with family. 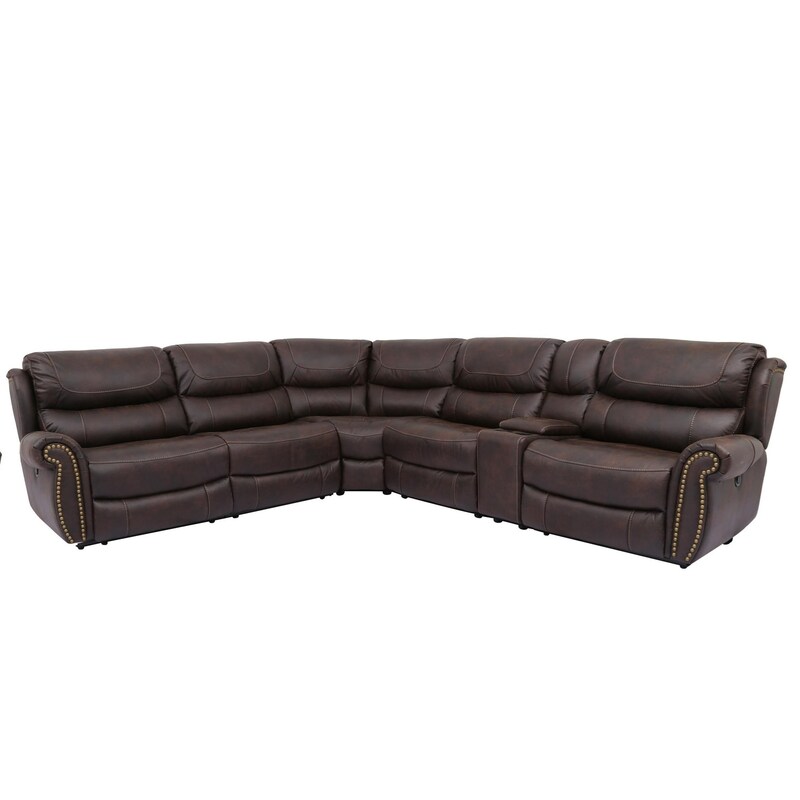 The Steely Dan Power Reclining Sectional with USB Port by Cheers at Royal Furniture in the Memphis, Nashville, Jackson, Birmingham area. Product availability may vary. Contact us for the most current availability on this product. 1012AR1.5-1E RAF Power Recliner 1 41.5" 40.5" 40.5"
1012HCE Straight Console with USB 1 13" 40.5" 40.5"
1012D1.5-1E Armless Power Recliner 1 32" 40.5" 40.5"
1012D1.5 Armless Chair 1 32" 40.5" 40.5"
1012AL1.5-1E LAF Power Recliner 1 41.5" 40.5" 40.5"
The Steely Dan collection is a great option if you are looking for Casual furniture in the Memphis, Nashville, Jackson, Birmingham area. Browse other items in the Steely Dan collection from Royal Furniture in the Memphis, Nashville, Jackson, Birmingham area.